At CityLight Coffee, we are committed to providing our customers with the best possible experience. What does this mean for you as our guest? Here's what you can expect. Ambience. You will be greeted with a smile from our friendly and knowledgeable English-speaking baristas who can offer you drink suggestions or let you choose from your favorites. Our two-floor dining area has plentiful comfortable seating, free wifi, and power outlets to keep your batteries charged. Watch the bustle of Soi 4 pass by in an armchair near our front windows, converse with our baristas near the coffee bar, curl up with a book on the sofa in an upstairs corner, or people watch from a stool on our balcony. Fun. Aside from being some of the most humorous and down-to-earth people in Southeast Asia, our baristas enjoy sharing conversations with you and offering a listening ear. We regularly host events and concerts (see our upcoming events here). Whether you are a local Thai, expat, or a tourist passing through, we want you to enjoy our staff and coffee shop and make CityLight Coffee your second home! See what's going on at CityLight Coffee over on our Facebook page. Barista experience. 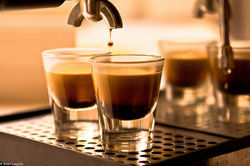 Good beans are only one of the factors in a delicious latte, cappuccino, or blended beverage. When our baristas pull a shot, they are doing so with exhaustive training and practice. They know how to maximize flavor and minimize bitterness through a combination of factors including the coarseness of the grind, the temperature of the water, the amount of tamping, and the duration of the brew cycle. The same holds true for steaming milk and the differing methods used to produce steamed milk for lattes, cappuccinos, and flat whites. All of our coffee is prepared using modern equipment from the finest Italian manufacturers like La Marzocco and Macap. Food and pastries. Your drink will pair perfectly with any of our freshly prepared pastries and cakes. Our New York cheesecake is homemade using imported cream cheese and hand-pressed crusts. Our carrot cake is perfectly moist and iced with delicious frosting. Fancy some savory food? We do too! We serve daily prepared sandwiches and even bake soft pretzels in our oven. Your nose will be delighted with smells of coffee and freshly baked cookies upon entering CityLight Coffee! CityLight cold creations. Our unique beverages classify as CityLight Creations. These are drink recipes that you won't find on any other menu in the world! Our customers' favorite is our Sukhumvit Sling, a drink that tastes as great as it looks: a fizzy limeade mixed with market fresh mint leaves and passion fruit garnished with a stalk of lemongrass. Also consider our Thai basil watermelon shake, lemongrass Thaitalian soda, and banassion fruit smoothie. Pour-over coffee. If a mug of traditional coffee is to your liking, we serve our hot and iced coffee using the pour-over method, which is the finest method of coffee preparation. New York Times food critic Oliver Strand describes coffee prepared with this method as "so clean, so round and fruity, that you can fully taste all those complex layers of flavor that are supposed to be lurking in the best single-origin and micro-lot beans." While a shot of espresso has a 30-second brew duration, a mug of our pour-over coffee will take one of our trained baristas 3 minutes to expertly and patiently pour water over grounds and a filter at given intervals. The flavor is definitely worth the wait! Espresso. We use the finest quality locally-sourced beans and roasters in our farm-to-mug process. We are proud to source our beans from Abonzo Coffee, a small coffee farm operated by Akha Hilltribe people on Doi Chaang, located 65km outside of Chiang Rai in Northern Thailand. We purchase our beans directly from the farmer, ensuring that no money passes through a middleman and maximizing the benefit to the community. Our beans are grown on the highest part of Doi Chaang which provides the perfect climate for full-flavored coffee beans. All of the farm laborers are paid fair wages and Abonzo Coffee seeks to use proceeds from their coffee sales to benefit education and job opportunities in their Akha community.